We are planning a few "weekend warrior" style renovations for our home over the next six months or so. While we are currently working on our foyer makeover, I have also been thinking about how we can overhaul our laundry room on a budget. The laundry room is on the first floor of our house, which is convenient, but it is tiny. Like a tiny box...with three doors in it - one to the garage, one to the house and one to the outdoors! We're thinking of stacking the washer and dryer to free up some space for built-in storage and seating. And we'll likely put some rustic wood shelving over the sink. If we're going to have laundry essentials on open shelves, I'm going to want them to look nice. I'm the kind of person that likes things to be stored out in the open as much as possible (or at the very least in labelled boxes so I don't forget where I put stuff) but I also get overwhelmed by clutter. So out in the open but still pretty is my ideal. For the autumn edition of Wayfair.ca's #DIYMyWay challenge, I was tasked with finding a unique way to use glass canisters from the Wayfair Basics line of wallet-friendly household essentials. Obviously these glass canisters could fulfill many purposes. They are ideal for storing dry beans, pasta and rice. They would be lovely as vases. They could hold craft supplies. You get the idea. And I'm sure you have many more ideas of your own. I thought they would lend themselves perfectly to my laundry room storage/display needs. Since I got my Cricut Explore Air cutting machine, I have been using it to cut out all sorts of things, like the gift tags I cut from old Christmas cards for my DIY Gift Tag Ribbon Garland. Of course, Cricut is ideal for creating vinyl labels for storage jars. And I am in love with Cricut's gold foil adhesive (as much as you can love gold foil adhesive - more than I love board games and less than I love chocolate is about right). In the Cricut Design Space (I used my iPad), click Text at the bottom to insert text. 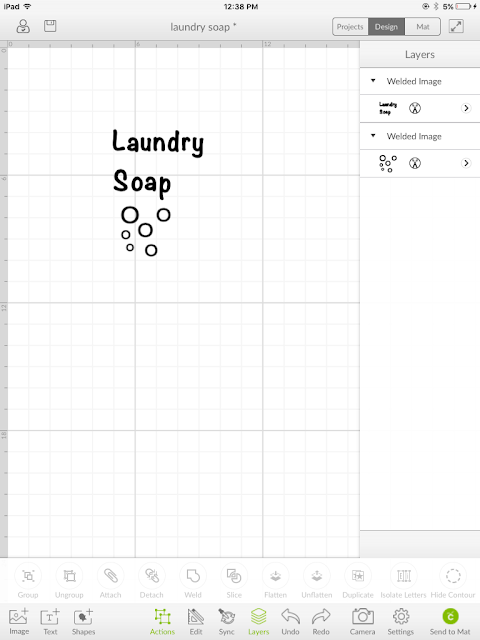 I typed "Laundry Soap" using the "Noteworthy" font, which is one of the free system fonts. You may wish to click Actions (on bar at bottom) and Isolate Letters so that you can space the letters a bit farther apart. To make bubbles, insert the letter "o" in the Lao Sangam MN system font. Click on the "o" and unlock the lock symbol that appears on the lower left. Drag the green and white symbol on the lower right of the image to re-shape the "o" to the bubble shape you desire. Then select Actions and Duplicate and duplicate the "o" for as many bubbles as you want. Re-size each bubble to be the size you want. I chose a mix of sizes to mimic real bubbles. Select the words "Laundry" and "Soap" by dragging a box over them with your finger. Tap Actions, then Group to group the two words together. Click on the words and drag the resulting box to re-size them. (You'll see the height and width pop up as you drag it.) I made each grouping of words about 4 inches wide to fit the glass canisters. Send to mat and follow the usual Cricut printing process. I printed on Cricut gold foil adhesive. I used transfer tape to transfer each word in its entirety to the canisters. For the "bubbles" and "buttons" I just peeled them off and applied them individually like stickers. Select Shapes at the bottom of the Cricut Design Space and insert a circle. Insert another circle. Click on the second circle and ensure that the lock icon on the lower left of the box surrounding it is locked rather than open.) Size it to be smaller than the first circle (with the proportions of a hole in a button). Select Actions and Duplicate to duplicate the smaller circle three times. Line the small circles up evenly two over two. Drag a box over them with your finger and select Actions and Group and Weld to group them and make them one image for slicing. Place them over the large circle. Drag a box over the whole thing and select Actions and Slice. You can now see in the Layers tab that you have sliced the four smaller circles out of the larger circle. 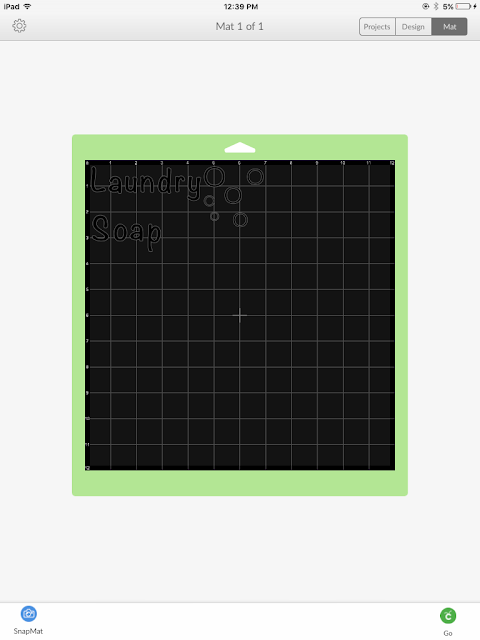 Drag the small circles away from the large circle and delete them by clicking on the x in the upper left of the box surrounding them. Duplicate the button and create various sizes as desired before sending your project to the mat to print on vinyl or gold foil. 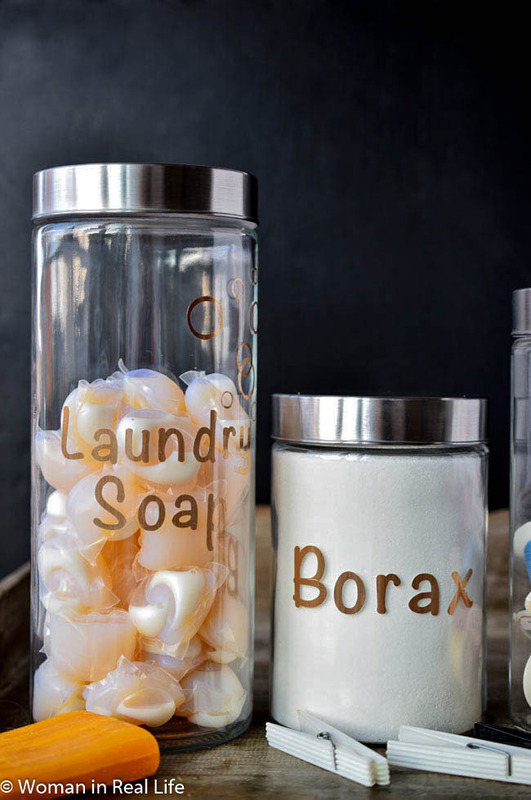 Find these multi-purpose canisters online and check out the other household organization goodies that you can find at Wayfair.ca...like closet storage, bins and baskets...I am imagining a beautifully organized home as I type! What would you store in these glass canisters? How else could you DIY them? These look amazing! So simple and elegant. Love them! So cool! 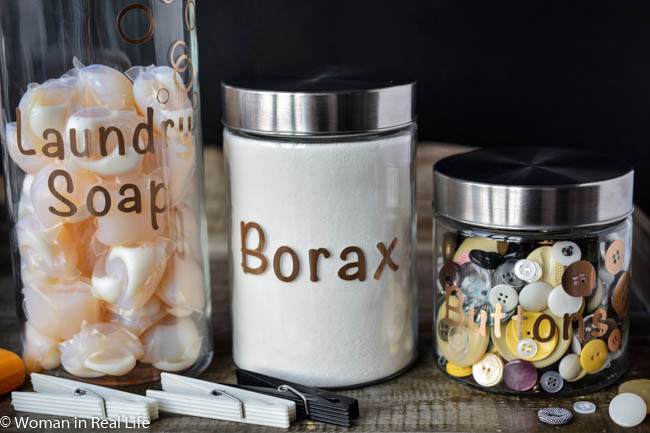 I totally need a set like this for my own laundry room! Anything gold wins my heart! It's so uplifting a colour isn't it? 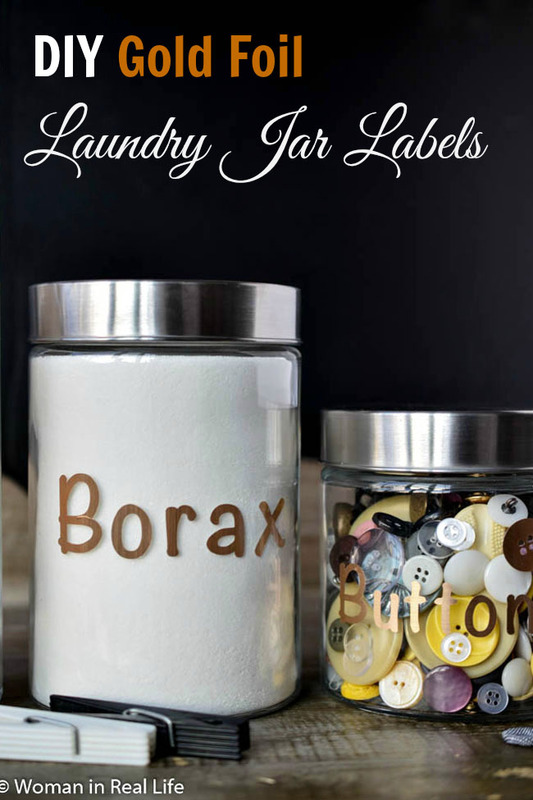 I love the easy, clean, organized look of gold letters on the glass containers, thanks very much for inspiration! I would love a Cricut Explore Air cutting machine. I would like to use it to use the jar for my sewing notions, button ect..
ohh that is very pretty! Love it! I hear ya Judy! My laundry room is teeny tiny! These came out so nice. I love having pretty things around to brighten up the chores. Something to consider making when we complete our reno! Good luck with your reno Laurie! I really like this idea. I have lots of glass canisters this would look fab on. Those cricut machines are rad. 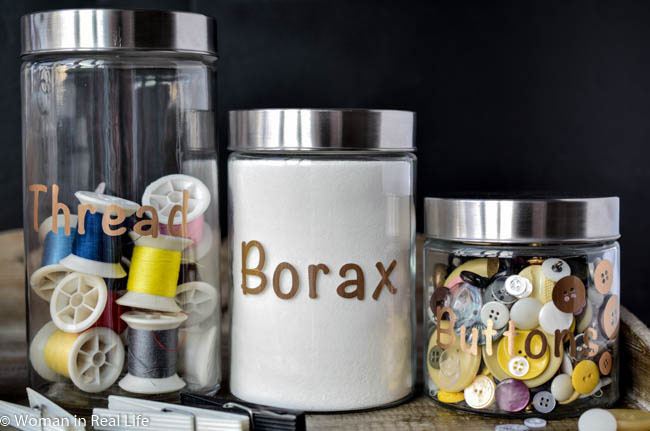 Oh there are so many things I could store in those Wayfair Basics canisters! (The Cricut Explore Air cutting machine would come in pretty handy too). I love this idea. It takes basic cannisters and makes them fabulous. I love learning about new ways to use the cricut. Trees chic! Makes the laundry experience a little better. Beautiful!! I think gold foil can fancy-up anything! What a great idea. Thanks for the tutorial! These canisters look fabulous with labels! Thanks Gabriela! I'm happy you like them!